East Stroudsburg’s PRSSA has joined hands with the school radio station, 90.3 WESS, for a fundraising event this fall. 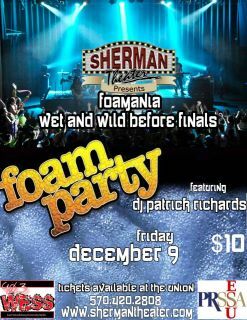 This event is called “Wet and Wild Before Finals” and will be held at the Sherman Theater on Friday December 9th. This event will feature DJ Patrick Richards, a local DJ who has performed at previous Sherman Theater events. The Sherman recently invested in a foam machine for a previous event and it will be in full effect at the “night club” style party next weekend. Tickets are on sale from all PRSSA and WESS club members and also at the Sherman Theater. Tickets are $10.00. The admission requirement is age eighteen to enter and age twenty-one to drink. For more information on campus please contact PRSSA or WESS. For off campus information contact the Sherman Theater at 570-420-2808 or at www.shermantheater.com.